I am looking for a name to a dried branch I saw some years ago that, when dry, removed the musty smell from a basement/or room. Any thoughts would be welcome. The branch did look like a dried yucca stem with dried flowers. 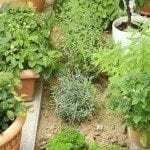 My best guess would be Rosemary, though many Herbs retain their oils and fragrance after drying and can help with musty smells.